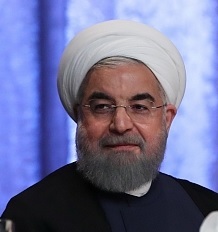 On September 18, President Hassan Rouhani discussed the nuclear deal, regional conflicts, human rights, and other issues at an event with American foreign policy analysts and journalists. He was in New York City to attend the opening of the U.N. General Assembly. The following are excerpts as translated by an Iranian interpreter, arranged by topic. If our countries sat next to one another and came up with a framework for the agreement, and, in order to have each sentence and every paragraph and every word discussed, held months of discussions, reached that agreement, and that agreement was approved by the U.N. Security Council, this signifies the agreement of all the participating countries in that dialogue. So, exiting from this agreement, or confronting this agreement, or weakening this agreement would equal, would mean, the weakening of international order, would mean a weakening of the United Nations, would mean a weakening of the U.N. Security Council and diplomacy. The JCPOA (Joint Comprehensive Plan of Action), after many years and many ups and downs, and after the United States initially chose the road of pressure and sanctions against Iran, believing that through these pressures and sanctions they could lead to Iran's surrender, and after they failed to reach the desired success through sanctions, they were ready to start on the path of dialogue. But, apparently, even during those years, there were dialogues. There were talks, but not constructive or serious [talks] aimed at reaching an agreement. Our commitment is if the heavy water production surpasses a certain level, we're willing to sell it. And if we do find a buyer, we are willing to sell it. Any time that we pass that stated and agreed upon level, we will beforehand announce that we are ready to sell it, and any company and entity that wishes to be the purchaser, we will sell it to them. Just as, on prior occasions, we have sold that to the Americans, to the Russians, and we are ready to sell it to others. Therefore, our commitment vis-a-vis heavy water is just that. When it surpasses a certain level, we will completely make that transparent and announce it as ready for sale. Vis-a-vis whether Iran is willing to hold talks with America or others about various issues, the path to travel upon is the same one that we have gone for the JCPOA. The esteemed Supreme Leader has said many times that the basis of our level of trust in the United States of America will be judged by their adherence to the JCPOA. If they are to live up to their commitments within this framework, then that shows that they can be trusted, and we can talk about other issues with the United States of America. However, if the United States tramples upon this agreement, it will show that continuing dialogue with America on any other issues will not yield any results or fruits. So, in other words, we see this as fundamental, and it will show us whether we can have a positive outlook on the possibility and look positively on the possibility of dialogue with America. Or, it will show what certain sides believe now in Iran, that trusting the United States will be fruitless. It was also mentioned vis-a-vis other issues, if we can hold talks with America on other issues, such as an interest section and things of that nature. All of these can come in following stages for us to be able to see whether fundamentally we can trust America on very important issues, because if we cannot trust America on the nuclear issue, all other topics are not worth discussing now. And the possibility of those discussions will not exist now or in the future. It was also mentioned vis-a-vis other issues if we can hold talks with America on other issues such as an intersection and things of that nature. All of these things can come at a later stage. In following stages, for us to be able to see whether fundamentally we can trust America on very important issues because if we cannot trust America on the nuclear issue all other topics are not worth discussing now. And the possibility of those discussions will not exist now or in the future. Our region is the greatest witness to the fact that the countries who through military power and threats wanted to resolve the regional issues in the Middle East to their own benefits, they did not succeed anywhere—not in Afghanistan, not in Iraq and not in Syria and not in Yemen, not in Libya. …[I]n order to resolve these issues we must first understand the difficulty and the problem well and deeply, based on that, come up with a resolution. Vis-à-vis regional issues, we have constantly been pursuing to hold dialogue and render aid based on the direct request of the nations and their legitimate governments from throughout the region in order to resolve their challenges and problems, based on which we rendered aid to the government in Baghdad in Iraq. Based on the same principle, we rendered help and aid to the government in Damascus in Syria, and based on this same principle, where the fight against terrorism necessitates, based upon which a formal request is issued, we have rendered that aid and assistance, so they were happy that in our region problems have decreased in Iraq. In Syria, they have decreased in comparison to previous years. However, simultaneously and continuously, the issue of terrorism as an important threat has a long path that has been laid ahead of us in order to resolve the threat of terrorism not only in our region but throughout the world. We from the very beginning were firm believers that terrorism should not take hold of the people of Syria and the country of Syria. This stance was not accepted by some countries, and this position was not accepted and they would say that certain terrorists should be labelled as opposition; in other words, label them as those who are opposed to the central government in Damascus. But after they saw that they continually behead scores of innocent people and committed unprecedented atrocities, they saw- they have finally realized- that there is no constructive way to victory against terrorism other than action and resolute action. And they have begun to say at least, whether truth or not, that they're using even their air power against the terrorists. Whether that's true or not, this is not something that we will want to discuss here. However, the historical course showed that when a nation stands up firmly and resolutely against terrorism, they can obtain final victory. Today, many great cities across Syria have been liberated from the hold of terrorists and about 60 percent of the Syrian territory is under the full control of the Syrian government, and the rest of that territory will on a step by step basis be free. But this does not mean that all of the problems facing Syria will be over. … [T]he danger is the terrorists —when they are completely driven out of Iraqi territory and when they are completely driven out from Syrian territory— where will they go? To which country will they move to? And, in various countries, what types of problems will they be the cause of? We are worried about other countries after this resolution of the Syrian and Iraqi problems and challenges. We are even worried for the West, for European countries and other countries. Therefore, the fight against terrorism must continue, steadfastly, until the very end, until decisive victory. And we all know that the root causes of terrorism emanate from many different challenges such as poverty, such as occupation, such as meddling in countries' internal affairs, such as the degradation of various personalities and various ethnic groups, and due to fairness. So, until the root causes are addressed and resolved, the issue of terrorism and terrorists cannot be completely understood and resolved. It was also said that certain individuals are imprisoned in Iran. My question is, what about the Iranians that are imprisoned in the United States? How come no one points to any of them, the Iranians that are imprisoned or those who are being prosecuted by the U.S. government unfairly and unjustly? Why is that we show no care towards them? If we are talking about human issues, human rights, all of them are human beings. So, if we are talking about imprisonment, let's talk about prisons and prisoners in any country, in every country, and whether a person who is imprisoned should be prosecuted or not, should be freed or not. What is the baseline? What is the standard upon which we pass judgement? Is it my judgement? Is it your judgement? So, in any country there is a judicial branch of the government, and that judicial branch carries its duty forward. Of course, you may say that the U.S. judiciary judges well. We believe it to be vice versa, and we believe that the U.S. judicial system does not judge well. And legally, we have many problems that we see in the U.S. judicial system. And perhaps you will see the judiciary branch of the Islamic Republic of Iran as not being good judges. So, we cannot from behind this table make decisions for the judiciary, either in America or in Iran. In Iran, the purviews and the powers of the president are very clearly stated, and the separation of the branches of the government are quite specific. The judiciary is completely independent and the president though legally can pursue matters when and where it is seen that it has transgressed from the laws. However, if it is a legal proceeding, in which the court is being held according to the rule of law, the accused has access to proper defense. And every step of the process, from the very beginning all the way up to the appeals process, and other processes, have been done according to the rule of law, to the word of the law. Therefore, it is the judiciary that makes the ultimate decision about a prisoner. Let me ask you, for example, if you were seeing an Iranian who was being prosecuted and ultimately judged to be sentenced to imprisonment, if we were to oppose that judgement rendered on the Iranian citizen, would you accept our opposition to that? But the people that you have named, many of them, as far as Iranian law is concerned, because Iranian law does not accept dual citizenship, they are Iranian citizens. Some nations do accept multiple citizenships for an individual, some do not. We are one of those that does not. Therefore, they are Iranians, and we do not recognize them as citizens of another country. In Iran, they are prosecuted as Iranians. Therefore, vis-a-vis this particular issue, I do believe that which is the purview and the responsibility of the administration and the president is to oversee the legal processes. If someone writes a letter vis-a-vis a specific prisoner with a specific and clear complaint we will investigate that. And if we determine that the processes were not according to the law, then that information will be transferred to the judiciary and it will be addressed properly. In other issues, as far as domestic policies, cultural issues, there have been freedoms that have been obtained to which we were committed and we will keep our commitments to those in my first term. I had promised citizens a bill of rights. I had announced that, and transferred the needed information to all of the institutions and offices of the government. We delivered on the rights of citizens, and my promise was that it will become active, it will be enforced, and I am fully willing and determined to its enforcement in the second term as well. All of those issues we promised, the administration sees itself as committed to those, and we do hope to have success in the coming years for this administration. One of the esteemed guests was speaking about the economy last year. We had seen a five percent growth rate, but in reality, we had a double-digit rate of growth, one of the very few countries to have seen such a rate of increase. And this year, the Persian calendar year, the first three months of the year we have seen a seven percent economic growth rate. And we hope to be a witness to the continuation of these rates of economic growth. The people of Iran wish to have very good relationships with various countries from around the globe, and they wish, within the framework of these good relationships and constructive cooperation, build their country. The most important objective of our people is the progress of the nation and the welfare of every citizen. And the most important program that was promised by this administration to the voters during the latest campaign was a fight against poverty, economic growth, as well as constructive and vast engagement with the world.